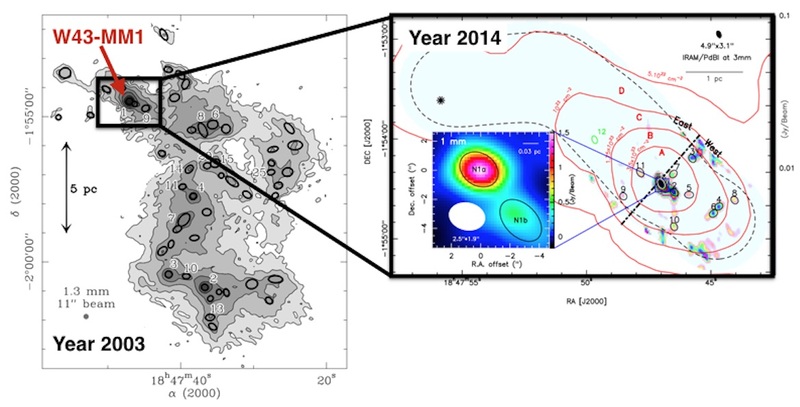 We published in Nature Astronomy a paper entitled: "The unexpectedly large proportion of high-mass star-forming cores in a Galactic mini-starburst". In other words, this "Galactic mini-starburst" forms mostly high-mass stars, when according to the "laws" of star formation a cluster of Sun-like stars was expected to form in their surrounding. This discovery is also the story of the increase in angular resolution over time, i.e. our ability to see smaller and smaller structure. 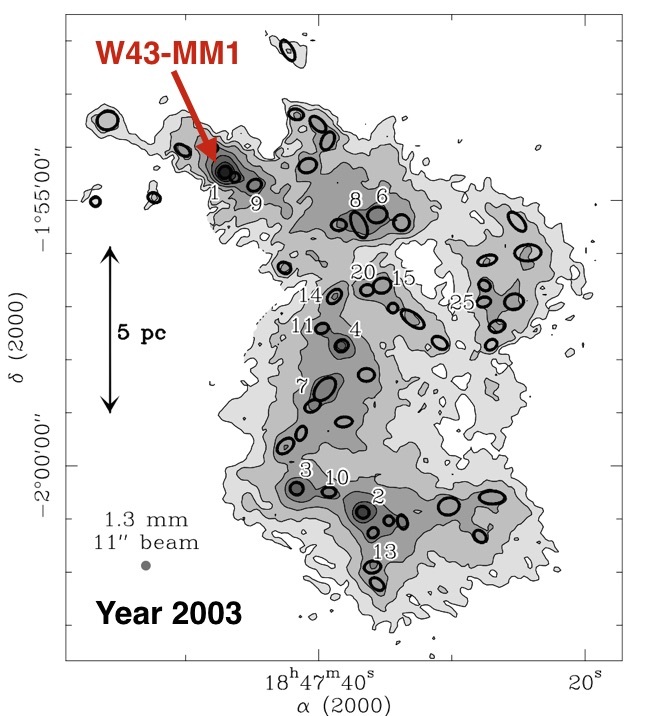 In 2003, F. Motte and her collaborators mapped the W43 complex with a camera called MAMBO installed in the radio-telescope IRAM/30m in the south of Spain. They found very dense clouds of gas, among which W43-MM1, which gathers enough gas to form about 4.000 Suns in an area of 40 times our Solar system. 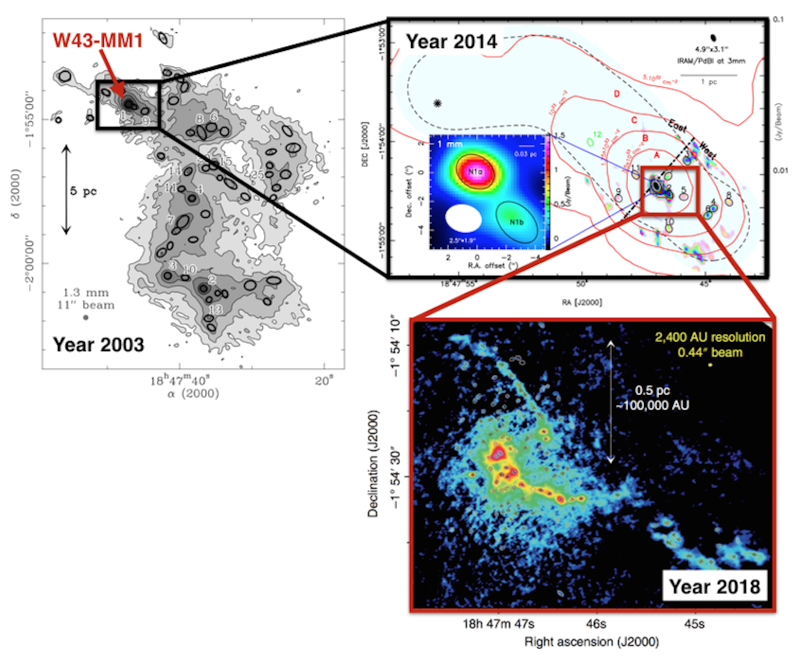 Then in 2014, we mapped this promising source with the Plateau de Bure, a millimeter interferometer located in the French Alps. We found that the gas was assembled in very massive and dense structures, like W43-N1, a core that has about 2100 times the mass of the Sun in gas, packed in about 15 times the area of the solar system. However, these observations were biased toward massive sources as they lacked sensitivity to detect the low-mass cloud structures. We found it intriguing that the gas would be so condensed, in comparison with the models of star formation that predicted that for one massive star (a star more massive than 8 times the Sun's mass), about 1000 stars of lower mass should form. Here, with cores as massive as 2100 times the mass of the Sun, the predictions suggested the formation of tens of massive stars, and hence, tens of thousands of low-mass stars such as the Sun. Given the repartition of the gas observed, those same models predicted the formation of a star cluster whose star density has not been observed in the Universe. From there, we knew that we were onto something and we requested the use of the most powerful observatory to study this star-forming region: the ALMA interferometer, located in Chile. ALMA revealed that about 300 cores were forming in the central part -- far from the tens of thousands predicted but, above all, it showed that very few low/intermediate-mass cores were forming. This constitutes the main result of the study. It casts doubts on the "universality of star-formation", used within all the communities of astrophysicists (Galactic, extra-Galactic, supernovae, blackhole, etc.). The study will be reproduced in other high-mass star-forming regions in the coming years and, if proven true, a new paradigm of star-formation will be set, where the stellar content depends strongly on the physical environment of the parental cloud.